Despite the contextual baggage and lack of suspense of this newly updated version of Dario Argento's classic, Guadagnino still proves to be a visceral filmmaker in modern cinema. In horror fan circles, Dario Argento is considered one of the greatest influencers of the genre in its modern form. His 1977 cult classic Suspiria is an example of ‘Giallo’ (an Italian horror genre) mixed with sharp storytelling. Now, flash forward to 2018, and director Luca Guadagnino (with recent fame from the sensual masterpiece Call Me by Your Name) is at the helm for this remake, which seems like an impossible task given the status in which the original is now regarded. However, with a few keynote differences, Guadagnino has conjured a version that is surprisingly different to Argento’s masterwork, but also highlights the fundamental flaws in which remakes are having to contend with. The skeleton of the story is exactly the same: Susie is an American dancer who enrols at a prestigious dance academy in Berlin where supernatural forces are stirring. However, unlike Argento’s film, the remake is set in a ‘Divided Berlin, 1977’, grounding the story with more realism. Dakota Johnson takes on the role of new arrival Susie, whilst Tilda Swinton impressively performs three roles; one of which is the lead choreographer Madame Blanc who recognises Susie’s talent and aspires her to be her protege. The other character Swinton plays is Dr. Josef Klemperer, a psychotherapist still suffering from the horrors of WWII after his wife, Anke, was lost during the Nazi Invasion in 1943. It’s this storyline which shares the main character arc of Susie, leading to a running time extended way beyond the 90-minute original. From the outset, it’s clear that Guadagnino has tried to distinguish his remake. Cinematographer Sayombhu Mukdeeprom’s elegant pans and long shots serve to mimic the nimbleness of ballet, and it makes for a welcomed laid back approach compared to Argento’s frenetic intensity. Some of the film’s horrific moments are based around dancing and contortion and the impressive usage of cross cutting is sure to provoke a squirm. The soundtrack by Thom Yorke (lead singer of Radiohead) is breathtaking, as his trademark style of abstract lyrics and gentle piano melodies combine beautifully with the visuals to enhance the unnerving atmosphere. 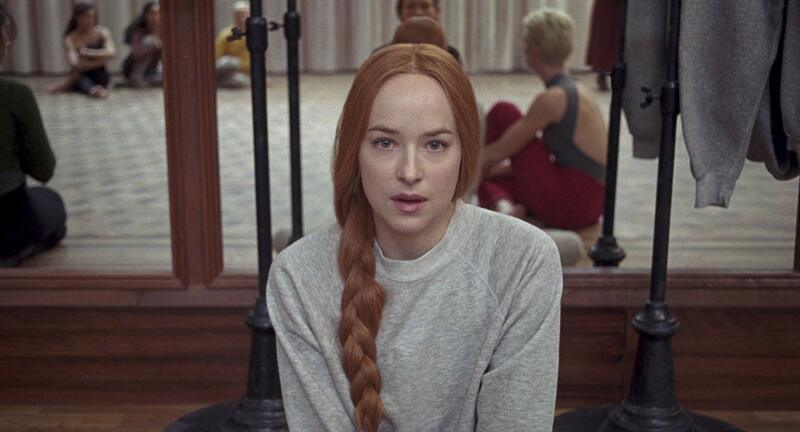 In particular, ‘Suspirium’ is a gorgeous and emotional piano ballad that accompanies the opening credits and creates a melancholic tone which the film thrives on. It’s another example of how Guadagnino’s work separates itself from its original source material in a unique way, and it’s refreshing for a horror film to take such an emotive tone. However, what the film does aesthetically well does not seem to match narratively. By situating the film contextually, the narrative has to intertwine with the setting and this is problematic. A similar film that did manage to achieve this was Guillermo Del Toro’s Pan’s Labyrinth, which used the fantastical world to reflect on the horror’s of the Spanish Civil War. In Suspiria though, the supernatural bares little resemblance to the Cold War, adding unnecessary baggage that does not contribute to the storytelling until the last act. The opening surprisingly lays out every detail which the original kept close to its chest, so there is a lack of suspense in what is essentially a conspiracy drama. This might have been intentional for scenes during the second half, but the film thus relies too heavily on audiences having an emotional connection with the uncanny events unfolding that may leave a few audience members alienated by the time the credits roll. It’s this absence of emotion that leaves a sour taste in one’s mouth at the climax of the film. Whilst Suspiria is a stunning piece of spectacle visually and gruesomely, it’s want to have any sort of sympathy feels all a little too self-indulgent. Nonetheless, there is plenty to appreciate in Guadagnino’s remake; the excellent performances from the cast and the abstract dance choreography are definite highlights. Pivotally, Suspiria does not try to mirror what has been done before. Rather, it addresses its predecessor from a different perspective and, although some changes might not work as well as others, it’s still stimulating to watch something different. Guadagnino’s Suspiria will be divisive, but whether it will be remembered is still to be answered. Suspiria (2018), directed by Luca Guadagnino, is distributed in the UK by MUBI, certificate 18.